If your pork belly piece has bone in: either ask your butcher to remove it for you, or take a large knife and angle it into the flesh under the bone, using long sawing motions to gently remove the bone from the rest of the belly piece. Remove the meat from the pan and run under cold water to cool. Once cool, pat the skin dry with kitchen paper and score gently using the tip of a sharp knife in diagonal ‘criss-cross’ cuts along the top of the skin, trying to only open up the top layer of fat and not cut into the meat itself. Dry the skin with kitchen paper once more and rub the salt into it. Turn your pork belly over; rub the five-spice onto the sides and bottom of the meat only, not the skin. Preheat the oven to 130°C/265°F/Gas ¾. Place the pork on a wire rack above a roasting tin skin-side up and roast in the oven for 1-1½ hours. Now turn the oven up to 230°C/450°F/Gas 8 and roast for a further 30–45 minutes, or until the skin is golden brown and crispy all the way through. 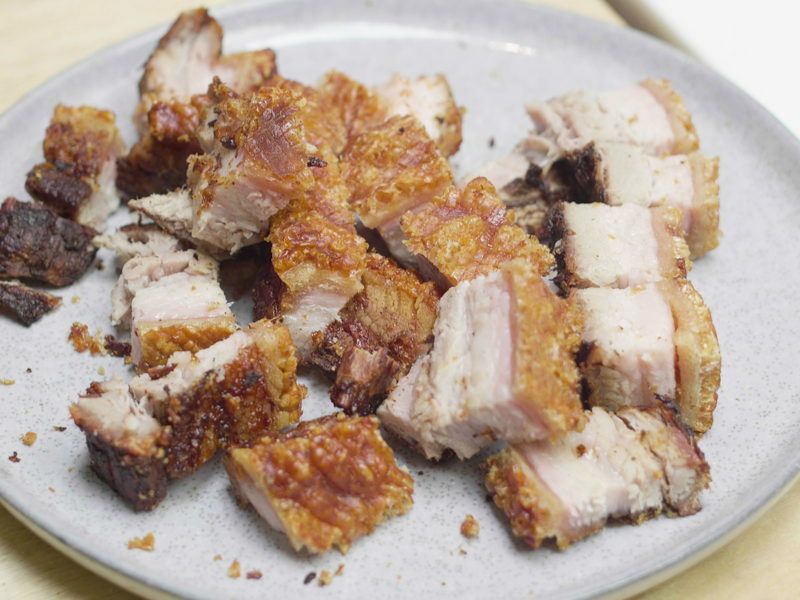 To judge whether the pork skin is crispy enough, give it a flick with your finger; if the sound is hollow like that from the bottom of a well-baked loaf of bread, then the pork is definitely crispy enough. Remove the pork from the oven and allow to rest for 15 minutes. Turn the pork skin-side down on a chopping board and slice through the meat with a sharp large knife or cleaver, pressing down on the top of the blade to slice through the crackling. Serve.